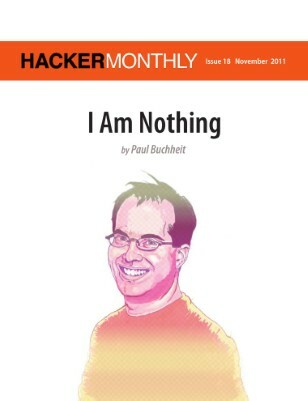 This November issue features Paul Buchheit on the cover with his article "I Am Nothing". And, Patrick McKenzie shares how to run "Software Businesses in 5 Hours a Week". On the Programming side, there are articles about JIT Spray, Evolutionary Algorithm and Bash Shortcuts. As a tribute, this issue also includes text from Steve Jobs' 2005 Stanford Commencement Address.